Price includes CMYK full colour print logo print in one position. Epoxy dome price on request. UK Delivery £20. VAT extra. 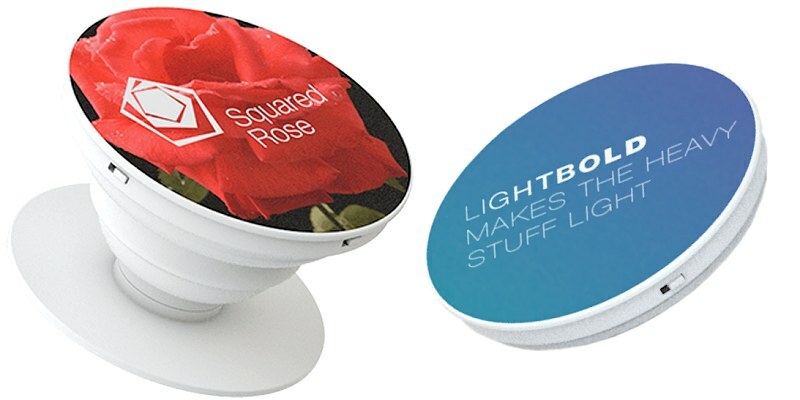 A full colour logo printed or expoxy resin domed Pop-up Phone holder for smartphones for easy one-hand holding, device prop-up and cable tidying. An exceedingly popular format with adjustable pop out distance or stick on two and wrap your headphones around them. A small adhesive support to attached to the back of the device, it becomes a practical rest for keeping the phone in a vertical position, or else as a convenient grip for typing, watching videos or taking photos while holding it in one hand. It can also act as a cable winder to keep small cables and headphones tidy. The distance between the adhesive base and the outer surface is adjustable so the Pop-up Phone can expand, contract or fold on one side according to its usage. The outer surface is circular and is customisable with CMYK printing and graphics in epoxy resin.